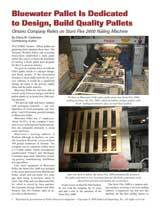 For more in depth information click here to read a Pallet Enterprise article written about Bluewater Pallet Inc.
Bluewater Pallet Inc. is a family owned and operated company with over 40 years of experience in producing high-quality pallets, skids and crates. We currently operate a 20,500 square foot facility in Warwick Township, Ontario. We are a fully automated pallet manufacturing facility that uses the most advanced pallet design system available to ensure that your pallet is designed and custom fit to your specific requirements. Every pallet is built using our multi-step quality assurance program and is inspected by a trained employee to confirm that our customer's specifications have been met. Bluewater Pallet Inc. has built a reputation based on integrity, honesty, dependability and professionalism. We take a hands-on approach to our work, always keeping complete customer satisfaction as our primary goal. Bluewater Pallet’s Accessible Customer Service Policy is available upon request.